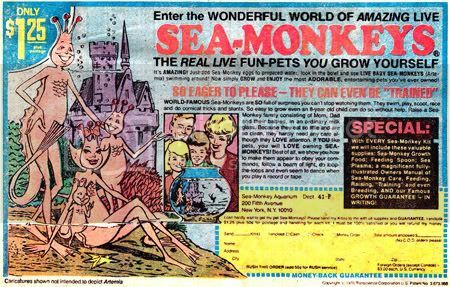 After careful observation I’ve accepted that the last member of my sea monkey colony has died and their aquarium home is bereft of life. Although tragic, there’s also a fitting symmetry since the inventor, evil marketing genius (and right wing nutcase) Harold von Braunhut, also died recently. Elizabeth gave me the tiny crustacean kit a few months ago because she knew that I had deep nostalgia for having all of my allowance money bilked out of me as a child. Judging from von Braunhut's success, I wasn’t the only child suckered by his seductive but very false advertising in comic books, or who had suffered greatly waiting the interminable 4-6 weeks for delivery. My current colony of sea monkeys (brine shrimp in reality) hatched from the freeze dried eggs and thrived for a while, and although the “monkeys” didn’t play ball or adorn their head prongs with bows as implied by the ads (or build a monument in gratitude to me, their feeder and caretaker), they did swim around vigorously, if rather pointlessly. So, I’m not sure what the cause of their demise was. I just had a terrible thought – I hope I didn’t empty out the aquarium prematurely, that there weren’t a bunch of viable eggs in there and a large die-off isn’t part of their natural cycle. Oh, God, I’m a monster.